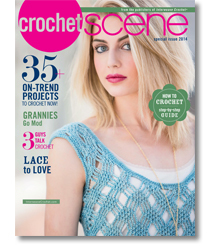 Crochet these cute and fun Ella Slippers, featured in the Crochetscene 2014 issue. Enjoy crocheting the Ella Slippers in Cascade Yarns' Ultra Prima #3793 Indigo Blue, #3772 Cornflower and #3746 Chartreus yarns. Looking for a fun and easy crochet project? The Blue Ella Crocheted Slippers Kit provides you with everything you need to crochet these cute and colorful slippers! Featuring granny square crochet motifs, these slippers work up quickly. Enjoy crocheting the Ella Slippers in Cascade Yarns' Ultra Prima #3793 Indigo Blue, #3772 Cornflower and #3746 Chartreus yarns. Wrap crochet into your lifestyle with these quick yet refined projects—garments, accessories, home dec projects, bags and more—that let you proclaim that you are a crocheter. Just the thing for cozying up with crochet and a Netflix binge, these delightful slippers work up quickly. Make a pair for yourself and another pair for a friend. Finished Size: 6 1/2 (8, 10)" long; 3 1/2 (4, 4 1/2)" wide to fit women’s S (M, L). Size shown measures 10" (L). Yarn: Cascade Yarns Ultra Pima (100% cotton; 220 yd [200 m]/3 1/2 oz [100 g];): shown here in 3792 brick (A); 3710 orchid (B); 3747 gold(C); 1 skein each. Hook: D/3 (3.25 mm) and C/2 (2.75 mm) for size small; E/4 (3.5 mm) and D/3 (3.25 mm) for sizes medium and large. Adjust hook size if necessary to obtain correct gauge. Gauge: Small: one square = 2 3/4"; med and large: one square = 3". 1 Skein each of Cascade Yarns' Ultra Prima in #3793 Indigo Blue, Ultra Prima in #3772 Cornflower and Ultra Prima in #3746 Chartreuse. 1 skein of yarn = 22 - 24 sts = 4" (10 cm), US 5 - 6 (3.75 - 4.0 mm). THIS KIT MAKES 2 pairs of slippers with colors as shown in this kit. Or you can crochet 3-4 pairs of slippers (depending on size) by subbing contrasting color for main color. We have a limited supply of each kit! Order the Blue Ella Crocheted Slippers Kit today.